Providing primary care services to more than 10% of San Francisco’s population, we work with providers citywide to coordinate primary care with specialists, hospitals, and other services. We serve overlooked populations such as low-income, homeless, immigrant, racially/ethnically diverse, LGBTQ, HIV-positive, and senior San Franciscans. Street Outreach Services (SOS) is the mobile outreach component of SFCCC’s Health Care for the Homeless (HCH) program. Since 1988, SOS has provided high-quality, nonjudgmental health services directly to homeless people in places where they live and congregate. Veterinary SOS provides free veterinary care to the companion animals of homeless San Franciscans, and links their human guardians with health care services. Operating since 2001, VetSOS is a project of SFCCC's street outreach services program. 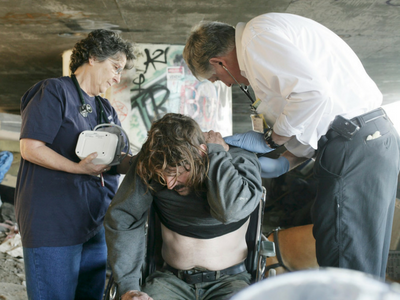 A partnership between SFCCC, five of our member organizations, and the San Francisco Department of Public Health (SFDPH), the San Francisco Health Care for the Homeless program has operated since 1988. SFCCC administers a federal HCH grant and contracts with these partners for the provision of HCH services, including medical, nursing, dental, substance abuse, mental health, case management, and outreach services. The program serves more than 15,000 homeless San Franciscans annually. For nearly three decades, SFCCC has served as a federal Ryan White CARE Act Part C grantee. The Ryan White HIV/AIDS Program provides a comprehensive system of care for approximately 52% of all people living with HIV in the United States, including primary medical care and essential support services. San Francisco Community Clinic Consortium's 11 member clinics serve over 112,000 low-income, uninsured, and medically underserved people per year. The clinics are located strategically throughout San Francisco to meet the health needs of the people and communities they serve. Comprehensive primary, preventive, and ambulatory care services are provided by a team of doctors, mid-level clinicians, nurses, dentists, and health practitioners under the supervision of a medical director. Many clinics offer "one stop shopping" including mental health services, dental and vision care, health promotion and disease prevention education. Services are also available in up to 20 languages. No one is turned away due to an inability to pay. Services are offered on a sliding scale, based on income and may be free depending upon an individual’s circumstances and programs offered. SFCCC, SOS, and Vet SOS want to thank you for your support over the years. With your help, we have been able to extend our SOS team and implement a new EHR for Vet SOS, in addition to providing care to over 1000 homeless San Franciscans last year. Click the link to find out what else we have been up to so far in 2019! The San Francisco Community Clinic Consortium Board of Directors and Staff cordially invite you to attend our Annual Gala on Thursday, June 27th, 2019 at The Green Room, San Francisco War Memorial and Performing Arts Center.